I'm very proud to have a Scottish Veterans Residence in my constituency, at Bellrock Close in Cranhill. This facility not only provides high quality, supported accommodation for veterans who are homeless or in need, but also offers a transitional support programme which sees veterans receive dedicated support from a key worker and support team. 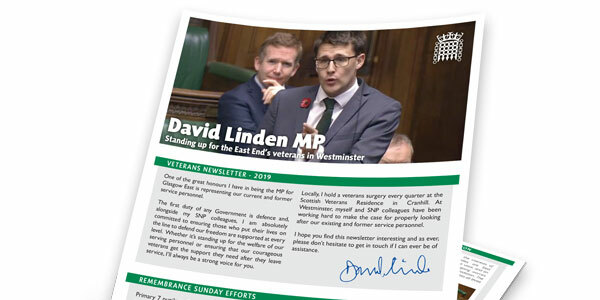 Since being elected, I have held several help & advice surgeries at Bellrock Close, resolving cases for residents — often with issues unique to those who have served in the armed forces. Expanding on my work with the veteran community, I'm proud to announce that I'll be publishing a periodic newsletter specifically for veterans, starting this month. I've published my first issue, which can be downloaded below. Enjoy!